Being bio-mechanically gifted or seen as “Superman” is not a thing that many of us can relate to. Yet it’s part of Martin Kaufmann’s work-a-day life. Tag, a recent amputee, is one of our daily dog walking clients and Martin is one of Tag’s heroes. After suffering a recent front leg amputation, Tag began having problems compensating with his remaining front leg/paw. Meet OrthoPets – the leading orthotic device manufacturer in the U.S. – and possibly the world. Upon learning of Poochy Doos, Kaufman invited us to Denver to learn more about the facility he founded, the patients he helps, and what makes him tic. We of course, jumped on the opportunity. Martin’s facility is amazing. His front office is as hi-tech as any surgeon’s office. Clean, shiny and professional. His production floor was equally impressive. From machinery to fabricating materials to production – Martin took us through the entire process. Everyone there – every single staff member – had a big smile on their face. They clearly love what they do! And it shows. From research and development, to quality controls – to totally customized end-products, OrthoPets rocks! The difference, before and after Tag was fitted with his orthotic device was very impressive. While Tag always enjoyed his walk, navigating terrain and his all-around stamina suffered after his amputation. As Martin explained it, “Paws trying to compensate for a lateral limb loss will tend to articulate inappropriately and cause strain on the paw, joints and forearm musculature.” Whatever the device is doing – we noticed an immediate difference in Tag – he was hard to keep up with. Clearly he loved his new “bionic leg” and was a very happy, waggy little guy again. Needless to say, Tag is just one of many patients who have received the gift of mobility from OrthoPets. Check out the video of Nakio, a dog who lost all four paws to frostbite after being abandoned in Nebraska. After being adopted, he was introduced to Martin, and now he’s the only dog in the world sporting orthotic paws. Does Martin leap over buildings with a single bound? Not quite, but Tag would say he comes pretty close. Dogs derive a lot of happiness and all around well-bring from being active and able to explore their environment. 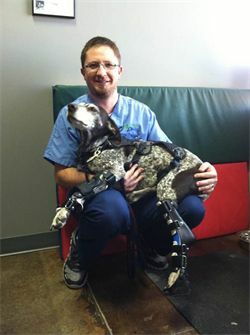 With Martin and OrthoPets, dogs can continue to enjoy their mobility and just their all around dogginess.